Nursing ‘callousness’? Context is everything.. When I wrote my first post exposing the flaws in the ‘HSMR’ mortality statistics that appeared to identify ‘excess’ mortality at Stafford hospital, and exposing the even bigger flaws in the way that the incorrect conclusions were seized and promulgated by the media and some politicians, I knew I was putting my head above the parapet and was likely to get shot at from some quarters. It’s been an interesting couple of months since then, with a number of accusations and a fair amount of diatribe coming from certain patients’ groups that were offended that I questioned their position. Not their personal experiences, but their claims that poor care led to ‘hundreds of needless deaths’ at Stafford hospital (it didn’t), and their wider agenda that has allowed them to be exploited by unscrupulous politicians who find a falsely-damning impression of Mid Staffs a useful weapon to wield against the NHS to justify the targeting and closure of other hospitals. A lot of this discussion has taken place on Twitter. One of the most constant refrains (apart from the idea that questioning statistics is somehow disrespecting the dead) has been the supposed ‘fact’ that the poor care at Stafford was caused in large part by an ‘uncaring’, ‘callous’ or ‘heartless’ attitude on the part of nurses. The constant repetition of this leitmotif has fooled some people into demonising nurses at the hospital, leading to numerous instances of verbal and even physical assault against them, with nurses being spat upon and called ‘murderer’ in the street, even in front of their young children. That this is unjustified is something I’ve already written about, and I spent a very moving couple of hours hearing passionate, compassionate nurses relate their experiences through tears. Anyone who doesn’t know better will look at something like that and be appalled at the thought of what ‘must’ have gone on. Now, I don’t know which incident she is referring to, and I can’t reply and ask her because she’s blocked me on Twitter (though still including me in her messages!) for questioning ‘her’ group. So I’ll tell you about a couple of incidents about which I do have full details. Imagine coming into a ward, and you see a young nurse and an elderly patient. The nurse has hold of the old gentleman’s robe and she’s pulling on it and screaming. The elderly man is clearly distressed and very unhappy about what’s been going on, but no matter how much he protests, the nurse refuses to let go of him. Abuse? Well, hear the context and decide. The old gentleman was in hospital because of lung cancer that had spread to his brain, causing erratic behaviour. Although usually placid and lucid, occasionally he would take it into his head to sprint as fast as his legs would carry him off the ward and out of the hospital. This behaviour started recently and suddenly, and although he was retrieved safely the first time it happened, if he successfully escaped the ward, he could easily come to harm – perhaps serious harm. The young nurse had seen him start ‘doing a runner’, grabbed onto his robe and was being pulled down the corridor behind him like a water-skier, screaming for other nurses and for security to come and help her prevent her patient leaving the ward and possibly coming to harm. Within 10 minutes or so, the patient was settled back in his bed, eating his evening meal as if nothing had happened. The nurse, who had put her own safety at risk to protect her patient from himself, was getting her breath back. Here’s another real-life incident. You enter a side-ward and see a strong young nurse pinning a frail-looking elderly woman’s arms down to the bed. The old woman doesn’t appear to be violent, and she’s pleading with the nurse to let her go, saying she’s hurting her. The nurse refuses to let go, and another nurse in the room ignores the scene and calmly goes about her business. The old lady was another unfortunate victim of metastatic lung cancer. Cancer cells had gone to her brain, just like they had with the old gentleman. Although cheery and pleasant, the brain tumour could cause her suddenly to lash out – and she had a particular tendency, whenever she needed an injection, of trying to grab the syringe and stab the nurse with it. The nurses had had a couple of close escapes, and so now they went in pairs to administer injections. One nurse would hold the old lady’s hands down, gently but firmly, while the other gave her an injection, and the whole thing was over in a couple of minutes with no one the worse for it. But to hear the old lady during the procedure, you’d think she was being murdered. Nobody blamed her – she was ill and her brain was affected – but if one of her relatives had entered the room at that precise moment, they might well have been appalled and complained. I’ve written before how things that might seem absolutely appalling in one set of circumstances can be regarded as heroism in another. Context is everything, and incidents like the two real-life ones above will be repeated thousands of times a day in hospitals all over the country. They don’t mean anyone is being abused, nor that anyone is being callous – but anyone seeing them without understanding the context (or willfully ignoring it) could easily think otherwise. The tweet sent by the lady on Twitter who is so angry at nurses and hospitals might relate to a genuine case of abuse or bad nursing. Such things do happen, but they are rare. Far more likely is that any one of a hundred alternative scenarios explains the context of the incident and renders it innocent, or perhaps even brave. The media and certain politicians are trying to exploit Mid Staffs to help create a new perception of the NHS in the minds of the public. Until this government took office, patient and public satisfaction with the NHS were at record highs, but a popular NHS is much harder to shrink, dismantle or sell off, so there’s a war going on for the minds and hearts of the people as regards the NHS. The Francis Report into events at Mid Staffs concluded overwhelmingly that poor care, where it occurred (which was in only 3 very busy wards), was caused by serious staffing shortages that led to staff being unable to meet basic needs because of the urgency of immediate, clinical issues – not by callous, uncaring frontline staff. But you’d never guess that from the ‘response’ of Health Secretary Jeremy Hunt to the report, nor from headlines and articles in a large section of the media. The tweet from the embittered lady and the ease with which context can be ignored, misunderstood or misrepresented – let alone the stress, emotion, weariness (and sometimes self-recrimination) that they must have been feeling in the heat of the moment – show something very clearly that it’s deeply unwise to simply accept the word of grieving relatives as ‘gospel truth’ when they describe incidents of supposed ‘callousness’. This is something that we’re being encouraged to forget at the moment by media and politicians with no scruples but with massive ulterior motives. Please don’t. Here here. I have been saying this for so long! It’s all about perception and what a lay person perceives to be the case isn’t always the case at all. I’ll give you another scenario, a nurse on a busy ward is about to get a bed ridden patient a bed pan, the cardiac arrest alarm go’s off, where are her priorities? Save a life or prevent someone from wetting the bed? Then you get the story…the nurse left my relative in a wet bed! You’ve blocked me on Twitter, Dee. I can’t reply to your messages, have to type in a fresh one to even comment on the dross you say about me. No problem! Will check again and unblock if needbe. I DIDNT BLOCK you…did Twitter? Could happily report you though! Do what you feel you have to. I stand by what I’ve said. It may be unpalatable to some, but it’s nonetheless correct. Reminds me of my late father in law who I nursed at home, Melanoma Cancer, it also attacked his brain. I had always had a great relationship with Pops, he was a true gentleman in every sense of the word. A few days before he died I sat beside his bed while he slept, he awoke and launched into an attack so violent that the chair I was sitting on went backwards and me with it, My stomach was bruised for weeks. My husband rushed in and with the help of his Mother retrained Pops from continuing the attack, it was disturbing to witness it. I’m sorry to hear that. It seems anything but uncommon – but anyone walking past as your husband and mum restrained him could easily think ‘abuse’ and get completely the wrong end of the stick. It’s why I always take Cure’s stories with a big pinch of salt. “Multiple perspectives”. “Putting yourself in someone else’s shoes”. Probably better ways to see and try to understand the world than always black or white – and less likely to lead to injustice, revenge, scapegoating, Daily Mail articles …..
‘Dummy stuck to babies (sic) face’ = dubious, unproven, overblown. ‘Twins die’ – thoroughly investigated and nurse investigated by the NMC with no sanction. 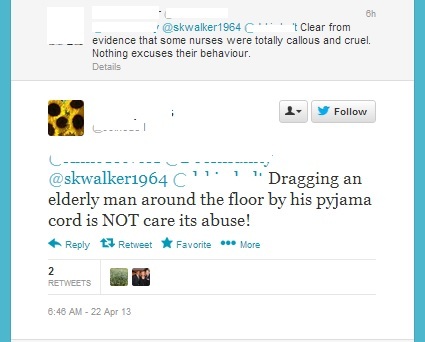 ‘Nurse’ pulls dementia patient – wasn’t a nurse, was a HCSW. *Nurses* REPORTED the incident – and the nurse giving evidence cried out of horror at the HCSW’s actions and compassion for the patient. You’re so desperate to slander nurses that you’ve lost your grip on reason. I feel sorry for you. You say “Christian” on your profile… Lord help us! BTW YOU have blocked me not other way around A Christian liar eh! Oh an wasn’t the nurse/HCA struck off?Expect Union stuck up for her though? No! Why? I haven’t blocked you at all. I’ve blocked maybe 2 people ever, and that was in extremis. Not aware anyone’s been struck off over the dummy incident. Feel free to provide a source for that claim, though. 1) Surely taking one tweet out of stream is like reporting one sentence of a conversation? Can lead to comments being – err – take out of context don’t you think? 2)When you redact details to ‘protect’ people maybe you should do the whole job? We know it’s a lady, we know her avatar, the date, the time and that you are in the thread….won’t be too hard to find out who you are talking about…. It’s a public comment, so if people want to track it down they’re free to do so. I’m just taking the steps I can reasonably take while establishing that it’s a genuine tweet. Yes, one tweet risks being taken out of context – but the whole point of this one is that it’s representative of a whole stream of them – and of a lot of non-Twitter comment, too. Published and refuted. Believe it or not, I have more pressing things to see to first before I grit my teeth to work through your comments sometimes. Thank you and I have posted evidence to support my claim but cant make it be published on blog! It’s all published. I don’t censor comments – even when they’re as predictable and unfounded as yours often are. Thank you for publishing and if anyone wants facts not fiction happy to provide but cant copy Skwalker in as HE blocked ME! As I said, you’re annoying but you’re not such an annoyance that I’ve blocked you. Maybe you forgot doing it..?